Hi everyone, welcome to my fourth tutorial! Making the double lightning bolt is actually not that different from making the single one; what you need to do is actually just repeat the steps from the regular lightning bolt tutorial. But because the double version received so many enthusiastic reactions I decided it deserved its own tutorial :) One tip: for this particular design transparant tape is quite useful! Let's get started! First make a regular lightning bolt on your nails as described in the tutorial, except that you don't have to add topcoat yet. While you're cutting all the tape strips for the first lightning bolt, cut one extra for each piece because you'll do the whole taping process twice. So in total you'll need two strips and two triangles for each nail. Let your nails dry completely, if necessary with the help of a fastdrying topcoat. After you've finished the first step and everything is dry, place a tape strip on top of the design, partly overlapping the tip color as shown in the picture. This is the part where transparant tape is really going to help you. 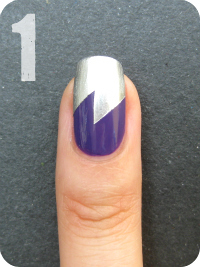 Then apply a triangle on the design, also partly overlapping the tip color. Now make sure the tape is fully adhered on the nail (it tends to lift up around the edges of the nail), if not use your finger or a tweezer to push everything down or reattach them if needed. 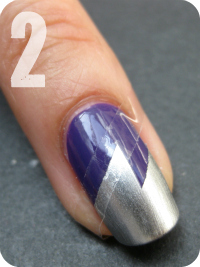 Then apply a pigmented top color with a thin coat and carefully peel off the pieces of tape right away. Let the design dry for a while. At last apply your topcoat, clean up and you're done! To add another color, just repeat the steps 2, 3 and 4 until you've reached the desired look (or till your nails are out of space :P). Polishes I used in this post are OPI Funky Dunkey, China Glaze Millenium and Essence Trust In Fashion. i just did this and it took a long time but i LOVE the results. thank you so so much for posting the tutorial! @Minnie: You go girl, haha and make sure to leave a link, I'd LOVE to see your attempt! This tutorial is very useful! Thank you! Oh this is fab! I've been wondering how you did it! Dankje voor de uitleg, ik ga dit zeker ook eens proberen! Thanks for the Tutorial Jane. I'm definitely trying this sometime. Only problem is that I have tried the regular lightening bolt and couldn't even get that right..Lol!! @Nail Stories: Keep practicing! :-) You can also practise this on your tip worn mani before you're going to remove it. That way you know the basecolour is definately dry and if you mess up you're removing it anyway. Good luck! omomgomg. you're such a sweetie! I literally was JUST going to mua message you to ask for a tutorial! LOL I tried to mimic this mani and failed miserably! I guess my problem was trying to cut the shape out of tape. doing it in stages is much smarter! ;) thank you!!! ur newest follower, perhaps you'd like to support me too? I tried this technique out on 2 different manis and put a link to your tutorial for them! Hi Jane! Take a look at my attempt! First of all, I absolutely adore your sight. You have such an eye for colors and designs. I'm loving all your tutorials. May I ask a question? Ok, well I know that was a question, but humor me : ) What silver polish did you use for these looks? I'm having a really hard time finding an one-coat opaque silver. @Erica: Thanks so much!! :-) The silver I use is Millenium from China Glaze, the best silver metallic ever! Unfortunately it's kinda hard to find now, so I'm still searching for a good substitute, because I'm almost halfway through my Millenium! These manicures put my shamefully neglected nails to shame - it's inspired me to get some shaping and painting done! Started this design and the first two colors came out AMAZING! I was so excited that I jumped the gun on the final color and didn't let the polish completely 110% dry and wrecked it all :-( oh well, having to start over just means more practice! i will have a picture up at some point when i finish... i did clouds (but crazy modified cuz i can't freehand for anything yet, lol) on one hand and i am repeating the colors to do this design on the other hand. storm themes! the tape makes it easier to do your non-dominant hand; takes so much of the complication out of it! so out of curiosity, how do you keep the base coat looking SO neat around the cuticle? when you're cleaning up, what are you using? i've tried q-tips and orangewood sticks dipped in remover and not, and i'm still struggling. the only thing that has really seemed to work is the tip of a dry metal file, but sometimes it pulls up the polish if it's still wet or tacky. help? thanks so much! Love the step by step photos. How long on average does it take to complete both hands?